Jim MacMillan has spent much of his adult life not necessarily looking down the barrel of a gun but looking through a lens at what those guns had done. MacMillan was a photojournalist for the Associated Press, the Philadelphia Daily News, and a freelancer in streets as mean as those in Iraq and North Philadelphia. He had become fascinated by what gun violence could perpetrate but also somewhat thrown off by what he felt were the clichéd responses around it. To that end, MacMillan launched Guncrisis.org a year ago. 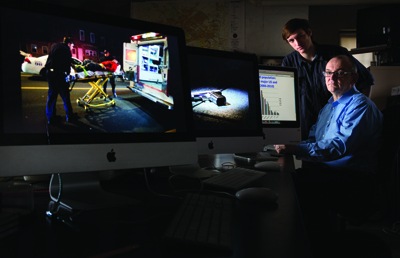 At its core is the reporting of every incident of gun violence in Philadelphia and every detail he and his partners—two other photographers, a writer, and interns, including Aaron Moser ’13—can find about each of those incidents. In part, Guncrisis.org was inspired by MacMillan’s association with Swarthmore’s War News Radio, which he has tried to transform into a place where those interested in journalism can try out ideas for research or practice. Two years ago, he met Aaron Moser, a psychology major from Great Barrington, Mass., who became Guncrisis.org’s first intern and researcher. Philadelphia, Moser and MacMillan contend, is a perfect laboratory through which to research gun violence. It has, they say, the highest rate of gun violence—not just homicides but the use of guns in violent acts from attempted murder to armed robbery—of any major city in the country. Guncrisis.org reports on its site all of the 300-plus gun-related homicides each year in the City of Brotherly Love, in addition to the four or five gun-violence nonhomicides that occur daily in the city. “We have sources at the police and others [that are] unofficial and community based, so we believe we get to 99 percent of the scenes—most with photography—and do both original reporting and aggregating, which we place on the website,” says MacMillan. Moser’s biggest contribution as an intern was researching the staggering economic impact of gun violence on the city and its most violent communities. He testified before a Philadelphia City Council caucus last summer that gun violence costs the city more than $3.5 billion a year. Moser’s calculations started with research done by the Rand Corp. and the Center for American Progress—the former a center-right think tank, the latter a more progressive one. “It is not just the personal loss but what it means to a community,” says Moser. “There are court costs and prison and police and medical care. Then there are the things that are tough to quantify—the cost of a murder to businesses on the street or to businesses that will not come into these neighborhoods where crime is most endemic. There is lost worker productivity and lost quality of life for the survivors. “We estimated that a 25 percent drop in violence would raise property values at least 2 percent, which across the city could be billions of dollars,” he adds. Moser and MacMillan say that Philadelphia is bucking the trend of other major cities. Gun violence and homicide are drastically down in places like Washington, D.C., and New York City, but homicide has risen in Philadelphia since 2009—to 331 fatalities in 2012. Thirty years ago, MacMillan notes, only about 70 percent of homicides were gun inflicted; now it is nearing 90 percent. Moser believes the economic argument helps explain the gun-violence propensity in Philadelphia, as his research indicates that the gap between the poor and affluent in Philadelphia is disproportional, even by the standards of other American cities. 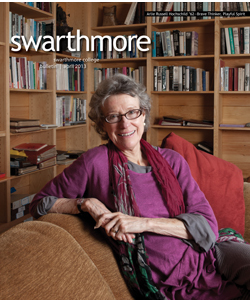 This spring, Swarthmore students were able to delve deeply into the consequences of gun violence in the new course Peace Studies and Action, taught by Lee Smithey, the associate professor of sociology who coordinates Swarthmore’s Peace and Conflict Studies Program. Students wrote articles based on their research that could appear on the Guncrisis.org site. Though they are happy that gun violence is on the lips of many Americans in the aftermath of the Newtown, Conn., tragedy and other mass homicides, Moser and MacMillan warn that shootings like those at Sandy Hook Elementary mask the overall problem of gun violence, particularly in cities. According to MacMillan, there is no official definition of mass shooting, but the FBI calls something a mass murder when four people are killed. MacMillan and Moser caution that Guncrisis.org’s research is new and evolving. But the discussion has to move, at least initially, from the polarizing talk of gun bans to prevention of violence in the first place, with community involvement and improved opportunities, especially for young men, who are most likely to commit or be the victims of gun violence. They hope that those who visit the Guncrisis.org site become fascinated by the subject and join the debate. To put more energy into furthering that aim and to work part time at Temple University’s Center for Public Interest Journalism, MacMillan left his College staff position in March. He will continue to work with Smithey’s class through the spring semester and with Moser to keep the dialogue going.